Universitas Udayana - UNUD or referred to as "Udayana University" is a reputable state-university in Indonesia, based in Bali Province. As a state-university, Udayana University is fully-owned by the Government of Indonesia through the Ministry of Research, Technology and Higher Education of the Republic of Indonesia. 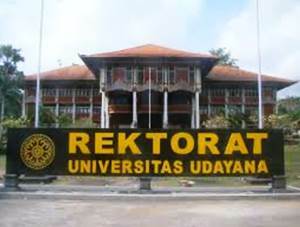 According to Udayana University's profile as cited by JobsCDC.com, Udayana University was first established in 1962 and initially started with four faculties: Faculty of Letters, Faculty of Medicine, Faculty of Veterinary Sciences and Animal Husbandry and Faculty of Education and Teacher Training. Udayana University now host 13 faculties, 25 master programs and 10 doctoral programs. Recent color photograph 3x4 (2 sheets). JobsCDC.com now available on android device. Download now on Google Play here. Please be aware of recruitment fraud. The entire stage of this selection process is free of charge. Udayana University - Recruitment D3, S1 Staff Non CPNS UNUD June 2016 will never ask for fees or upfront payments for any purposes during the recruitment process such as transportation and accommodation.